The Civic is a sixteen story condo tower situated next to PGE park and the MAX station. It features approx 261 units configured as 196 one bedroom lofts, 56 two bedroom homes and 9 penthouses. This is a highly energy efficient building that is LEED certifed Gold. The Civic features a public plaza, a very nice lobby, concierge service, secured entry and underground parking. There are 10 listings found for The Civic. 5th floor with incredible views facing east-city lights & sunrise. No rental cap! Brand new wood floors. 24 hr concierge. 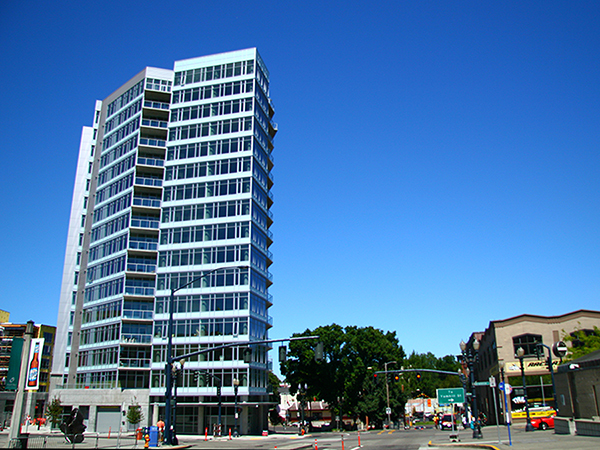 Located across from providence park, near Max, the pearl and all that NW PDX has to offer. Very cool urban condo in the heart of Portland.Even has a hard to get deeded parking space in the parking garage. Elevator access from parking to the 5th floor. Unit 203. East facing, floor to ceiling windows and steps to shops, restaurants, bars and Providence Park. Great investment, no rental cap. Washer and dryer and stainless kitchen appliances included. 1 deeded parking spot included as well as a storage unit. Million dollar 9th floor east views! Upgraded w/private bedroom. Floor to ceiling windows! Enjoy amazing lifestyle: walk to great restaurants, shopping, pubs, coffee shops, Providence Park/Timbers games, Crystal Ballroom concerts, dancing & shows, Mission Theater, The Pearl, Downtown. Walk score 97, transit score 89. Great investment: No rental cap (1600/mt) 1 deeded pking+ x-storage. Custom blinds, hardwoods, gas, granite. LEED certif. Live in the heart of Portland mins away from NW 23rd, MAC, Good Sam, Pearl+more! MAX all over town+Nike & Intel. New Providence Park expansion to be completed June 1st. Light & bright unit w/ balcony & huge SW facing windows. Hardwoods, kit w/ quartz, gas & SS app. 24-HR concierge. 2 parking spaces+2 storage areas. No rental cap! Investors welcome. Rented for $2595 per month. LEED Gold building. W/D, all appliances & TVs included. Rarely available NW Civic Corner floorplan. Light and bright 2 BED/2 BATH with epic views of the west hills, Fremont Bridge, St. Helens. This meticulous unit features mahogany floors, 9' ceilings, an open chef's kitchen with high-end SS appliances, large covered terrace. Secure separate parking for 2, storage unit and 24hr concierge. MAX Station at doorstep, easy commute to Nike/Intel. Excellent schools. Walk Score 98, Bike Score 92.